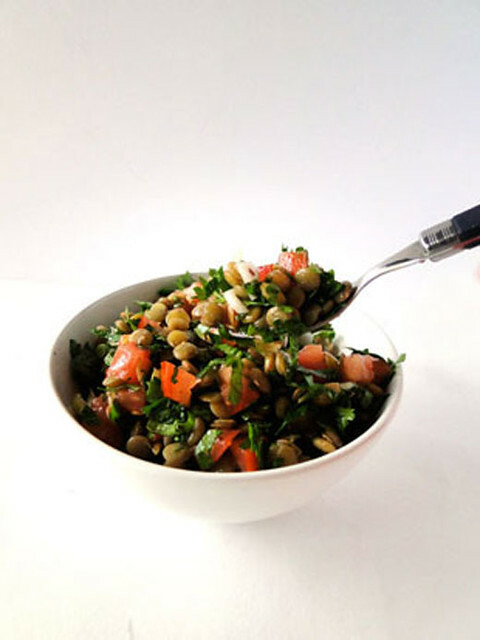 Being Lebanese, I have an affinity towards eating grains; rice, beans, chickpeas, and lentils… And I’m crazy about lentils; mjadra (lentil pottage), mdardra (lentil and rice with blackened onions), adas bi hamood (lentil and swiss chard soup), shorbet adad (red lentil soup)… are my favorite meals, not only because they’re super food with the highest source of protein, but also because they’re so amazingly tasty. Now, you are all familiar with the tabbouleh, the national dish of Lebanon and the pride of Lebanese cooks, a parsley salad flecked with tomatoes, bulgur, onion and mint. So what about pimping out the original tabbouleh, replacing the bulgur with cooked lentils. I just loved the idea, and let me tell you something, you will find it impossibly hard to stop digging your spoon into this salad once you start. Cover lentils with water and bring to a boil, then simmer for 20 minutes or till they are soft but not mushy. Drain and set aside to cool. Transfer lentils to a large bowl, add chopped tomatoes, parsley, mint, onions. Toss with olive oil, lemon juice, salt and pepper, cinnamon and sumac. Stir to combine. Couvrez les lentilles avec de l'eau. Amenez à ébullition, réduisez la chaleur et laissez cuire 20 mn jusqu'à ce que les lentilles soient tendres mais pas écrasées. Egouttez et réservez. Transférez les lentilles dans un saladier. Ajoutez tomates, persil, menthe, oignons. Assaisonnez de sel, poivre, cannelle, huile d'olive, citron et sumac. Mélangez et servez! A beautiful tabouleh! I like that version. I've done this a few times and love it! Which is nice because I've grown up used to having tabbouleh in the fridge at all times. Love sneaking in for a spoonful here and there ... but it's nice to mix it up once and awhile and have something different to snack on. Looks very colourful and delicious! This looks delicious! It should be interesting with the cinnamon and sumac. lentil tabouleh,a wonderful idea!so colourful! ton taboulé est très beau chicho! I can just imagine that this is the perfect salad. I'm sure I'd be addicted! Wonderful blog and lovely post! A healthy bowl of deliciousness. Are you back from your trip? Une idée originale ! Je suis comme toi, j'aime les lentilles et le taboulé donc j'imagine que ça doit être très bon ! What a fantastic and delicious tabouleh! Would love to try this! Yum! I love lentils/chick peas etc. too. This salad looks so fresh and delicious. Il doit etre très bon ton taboulé avec les lentilles! I'm crazy about lentils too! I'm drawn to any dish that includes them, and this looks like a great one. Hi, It's my first time visiting your lovely site. You have so many delicious recipes. I too love lentils and am looking forward to trying some of your recipes, thanks for sharing. Cherine, this sounds and looks crazy good! I love tabbouleh as it is, replace it with one of my favorite grains, lentil-I'm all over it. Congrats! You are n Top 9! Love your salad....refreshing, healthy and delicous. Hi am Nesrine, from Egypt,love your dish :) making it nowwwwwwwww. Wow this is one of my favortie salad. 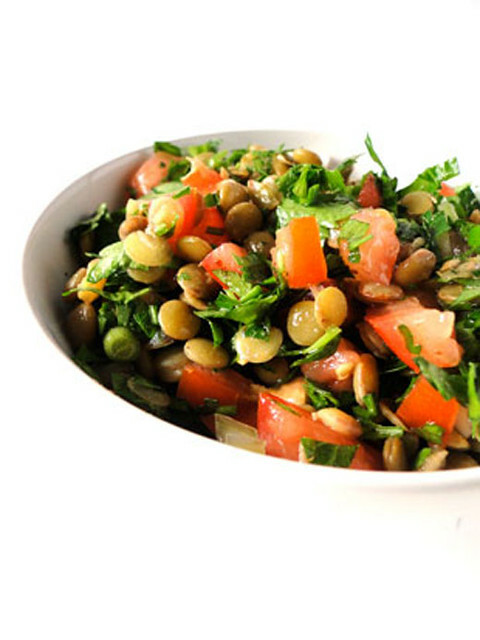 We call it just lentil salad. It is absolutely so healthy and perfect as a lunch or side dish. gorgeous pictures! How can you go wrong with lentils on a salad? This one looks delicious. Congrats on Making FB's top 9! Sounds like a great idea to me; I love lentils for all the protein and fiber they pack in. I'm saving this for sure! Ton taboulé me fait envie, ça change un peu du traditionnel à la semoule. Merci ! I'll be making this soon! Love the colors. You can practically taste it just by looking at the picture! 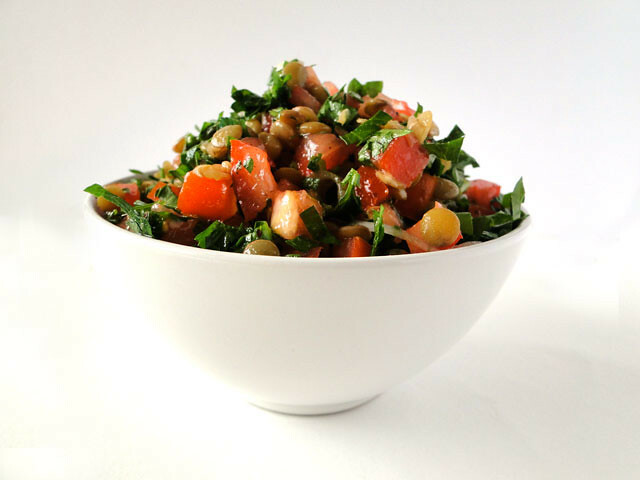 Tabouleh with lentils sounds like a great idea! I love tabouleh a lot, and this is to me a nice twist on it. Thanks for sharing! Une salade merveilleuse et que je devrais faire plus souvent! This looks delicious! I love that it is a naturally gluten-free tabbouleh. I love all those dishes you mentioned, so I have a feeling I will be back to check them out! Another smart idea! A great way to get protiens with your veggies. Another dish to go on my must try list... your blog is really making that list longer than my mind can rest at ease with.